Fish farming or pisciculture involves raising fish commercially in tanks or enclosures such as fish ponds, usually for food. It is the principal form of aquaculture, while other methods may fall under mariculture. A facility that releases juvenile fish into the wild for recreational fishing or to supplement a species' natural numbers is generally referred to as a fish hatchery. Worldwide, the most important fish species produced in fish farming are carp, tilapia, salmon, and catfish. Demand is increasing for fish and fish protein, which has resulted in widespread overfishing in wild fisheries. China provides 62% of the world's farmed fish. As of 2016, more than 50% of seafood was produced by aquaculture. Farming carnivorous fish, such as salmon, does not always reduce pressure on wild fisheries. Carnivorous farmed fish are usually fed fishmeal and fish oil extracted from wild forage fish. The 2008 global returns for fish farming recorded by the FAO totaled 33.8 million tonnes worth about $US 60 billion. Aquaculture makes use of local photosynthetic production (extensive) or fish that are fed with external food supply (intensive). Growth is limited by available food, commonly zooplankton feeding on pelagic algae or benthic animals, such as crustaceans and mollusks. Tilapia filter feed directly on phytoplankton, which makes higher production possible. Photosynthetic production can be increased by fertilizing pond water with artificial fertilizer mixtures, such as potash, phosphorus, nitrogen, and microelements. Another issue is the risk of algal blooms. When temperatures, nutrient supply, and available sunlight are optimal for algal growth, algae multiply at an exponential rate, eventually exhausting nutrients and causing a subsequent die-off in fish. The decaying algal biomass depletes the oxygen in the pond water because it blocks out the sun and pollutes it with organic and inorganic solutes (such as ammonium ions), which can (and frequently do) lead to massive loss of fish. An alternate option is to use a wetland system, such as that used in the commercial fish farm Veta La Palma, Spain. To tap all available food sources in the pond, the aquaculturist chooses fish species that occupy different places in the pond ecosystem, e.g., a filter algae feeder such as tilapia, a benthic feeder such as carp or [catfish, and a zooplankton feeder (various carps) or submerged weeds feeder such as grass carp. Despite these limitations, significant fish farming industries use these methods. In the Czech Republic, thousands of natural and semi-natural ponds are harvested each year for trout and carp. The large Rožmberk Pond near Trebon, built in 1590, is still in use. In these kinds of systems fish production per unit of surface can be increased at will, as long as sufficient oxygen, fresh water and food are provided. Because of the requirement of sufficient fresh water, a massive water purification system must be integrated in the fish farm. One way to achieve this is to combine hydroponic horticulture and water treatment, see below. The exception to this rule are cages which are placed in a river or sea, which supplements the fish crop with sufficient oxygenated water. Some environmentalists object to this practice. The cost of inputs per unit of fish weight is higher than in extensive farming, especially because of the high cost of fish feed. It must contain a much higher level of protein (up to 60%) than cattle feed and a balanced amino acid composition, as well. These higher protein-level requirements are a consequence of the higher feed efficiency of aquatic animals (higher feed conversion ratio [FCR], that is, kg of feed per kg of animal produced). Fish such as salmon have an FCR around 1.1 kg of feed per kg of salmon whereas chickens are in the 2.5 kg of feed per kg of chicken range. Fish do not use energy to keep warm, eliminating some carbohydrates and fats in the diet, required to provide this energy. This may be offset, though, by the lower land costs and the higher production which can be obtained due to the high level of input control. Aeration of the water is essential, as fish need a sufficient oxygen level for growth. This is achieved by bubbling, cascade flow, or aqueous oxygen. Clarias spp. can breathe atmospheric air and can tolerate much higher levels of pollutants than trout or salmon, which makes aeration and water purification less necessary and makes Clarias species especially suited for intensive fish production. In some Clarias farms, about 10% of the water volume can consist of fish biomass. The risk of infections by parasites such as fish lice, fungi (Saprolegnia spp. ), intestinal worms (such as nematodes or trematodes), bacteria (e.g., Yersinia spp., Pseudomonas spp. ), and protozoa (such as dinoflagellates) is similar to that in animal husbandry, especially at high population densities. However, animal husbandry is a larger and more technologically mature area of human agriculture and has developed better solutions to pathogen problems. Intensive aquaculture has to provide adequate water quality (oxygen, ammonia, nitrite, etc.) levels to minimize stress on the fish. This requirement makes control of the pathogen problem more difficult. Intensive aquaculture requires tight monitoring and a high level of expertise of the fish farmer. Very-high-intensity recycle aquaculture systems (RAS), where all the production parameters are controlled, are being used for high-value species. By recycling water, little is used per unit of production. However, the process has high capital and operating costs. The higher cost structures mean that RAS is economical only for high-value products, such as broodstock for egg production, fingerlings for net pen aquaculture operations, sturgeon production, research animals, and some special niche markets such as live fish. Raising ornamental coldwater fish (goldfish or koi), although theoretically much more profitable due to the higher income per weight of fish produced, has been successfully carried out only in the 21st century. The increased incidences of dangerous viral diseases of koi carp, together with the high value of the fish, has led to initiatives in closed-system koi breeding and growing in a number of countries. Today, a few commercially successful intensive koi-growing facilities are operating in the UK, Germany, and Israel. Some producers have adapted their intensive systems in an effort to provide consumers with fish that do not carry dormant forms of viruses and diseases. In 2016, juvenile Nile tilapia were given a food containing dried Schizochytrium in place of fish oil. When compared to a control group raised on regular food, they exhibited higher weight gain and better food-to-growth conversion, plus their flesh was higher in healthy omega-3 fatty acids. Within intensive and extensive aquaculture methods,numerous specific types of fish farms are used; each has benefits and applications unique to its design. 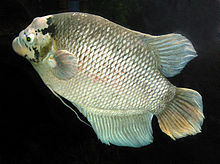 Giant gourami is often raised in cages in central Thailand. Fish cages are placed in lakes, bayous, ponds, rivers, or oceans to contain and protect fish until they can be harvested. The method is also called "off-shore cultivation" when the cages are placed in the sea. They can be constructed of a wide variety of components. Fish are stocked in cages, artificially fed, and harvested when they reach market size. A few advantages of fish farming with cages are that many types of waters can be used (rivers, lakes, filled quarries, etc. ), many types of fish can be raised, and fish farming can co-exist with sport fishing and other water uses. Cage farming of fishes in open seas is also gaining popularity. Given concerns of disease, poaching, poor water quality, etc., generally pond systems are considered more simple to start and easier to manage. Also, past occurrences of cage-failures leading to escapes, have raised concern regarding the culture of non-native fish species in dam or open-water cages. On August 22, 2017, there was a massive failure of such cages at a commercial fishery in Washington state in Puget Sound, leading to the release of nearly 300,000 Atlantic salmon in non-native waters. This is believed to risk endangering the native Pacific salmon species. Though the cage-industry has made numerous technological advances in cage construction in recent years, the risk of damage and escape due to storms is always a concern. Semi-submersible marine technology is beginning to impact fish farming. In 2018, 1.5 million salmon are in the middle of a year-long trial at Ocean Farm 1 off the coast of Norway. The semi-submersible US$300 million project is the worlds first deep-sea aquaculture project, and includes 61-meter (200 ft)-high by 91-meter (300 ft)-diameter pen made from a series of mesh-wire frames and nets, designed to disperse wastes better than more conventional farms in sheltered coastal waters, and therefore, be able to support higher fish packing density. Recently, copper alloys have become important netting materials in aquaculture. Copper alloys are antimicrobial, that is, they destroy bacteria, viruses, fungi, algae, and other microbes. In the marine environment, the antimicrobial/algaecidal properties of copper alloys prevent biofouling, which can briefly be described as the undesirable accumulation, adhesion, and growth of microorganisms, plants, algae, tube worms, barnacles, mollusks, and other organisms. The resistance of organism growth on copper alloy nets also provides a cleaner and healthier environment for farmed fish to grow and thrive. Traditional netting involves regular and labor-intensive cleaning. In addition to its antifouling benefits, copper netting has strong structural and corrosion-resistant properties in marine environments. Copper-zinc brass alloys are deployed in commercial-scale aquaculture operations in Asia, South America, and the USA (Hawaii). Extensive research, including demonstrations and trials, are being implemented on two other copper alloys: copper-nickel and copper-silicon. Each of these alloy types has an inherent ability to reduce biofouling, cage waste, disease, and the need for antibiotics, while simultaneously maintaining water circulation and oxygen requirements. Other types of copper alloys are also being considered for research and development in aquaculture operations. In Southeast Asia, the traditional cage farming platform is called kelong. These fish-farming ponds were created as a cooperative project in a rural village in the Congo. Using this method, water allotments can be stored in ponds or ditches, usually lined with bentonite clay. In small systems, the fish are often fed commercial fish food, and their waste products can help fertilize the fields. In larger ponds, the pond grows water plants and algae as fish food. Some of the most successful ponds grow introduced strains of plants, as well as introduced strains of fish. Control of water quality is crucial. Fertilizing, clarifying, and pH control of the water can increase yields substantially, as long as eutrophication is prevented and oxygen levels stay high. Yields can be low if the fish grow ill from electrolyte stress. The composite fish culture system is a technology developed in India by the Indian Council of Agricultural Research in the 1970s. In this system, of both local and imported fish, a combination of five or six fish species is used in a single fish pond. These species are selected so that they do not compete for food among them by having different types of food habitats. As a result, the food available in all the parts of the pond is used. Fish used in this system include catla and silver carp which are surface feeders, rohu, a column feeder, and mrigal and common carp, which are bottom feeders. Other fish also feed on the excreta of the common carp, and this helps contribute to the efficiency of the system which in optimal conditions produces 3000–6000 kg of fish per hectare per year. One problem with such composite fish culture is that many of these fish breed only during monsoon. Even if fish are collected from the wild, they can be mixed with other species, as well. So, a major problem in fish farming is the lack of availability of good-quality stock. To overcome this problem, ways have now been worked out to breed these fish in ponds using hormonal stimulation. This has ensured the supply of pure fish stock in desired quantities. One of the largest problems with freshwater pisciculture is that it can use a million gallons of water per acre (about 1 m³ of water per m²) each year. Extended water purification systems allow for the reuse (recycling) of local water. The largest-scale pure fish farms use a system derived (admittedly much refined) from the New Alchemy Institute in the 1970s. Basically, large plastic fish tanks are placed in a greenhouse. A hydroponic bed is placed near, above or between them. When tilapia are raised in the tanks, they are able to eat algae, which naturally grow in the tanks when the tanks are properly fertilized. The tank water is slowly circulated to the hydroponic beds, where the tilapia waste feeds commercial plant crops. Carefully cultured microorganisms in the hydroponic bed convert ammonia to nitrates, and the plants are fertilized by the nitrates and phosphates. Other wastes are strained out by the hydroponic media, which double as an aerated pebble-bed filter. This system, properly tuned, produces more edible protein per unit area than any other. A wide variety of plants can grow well in the hydroponic beds. Most growers concentrate on herbs (e.g. parsley and basil), which command premium prices in small quantities all year long. The most common customers are restaurant wholesalers. Since the system lives in a greenhouse, it adapts to almost all temperate climates, and may also adapt to tropical climates. The main environmental impact is discharge of water that must be salted to maintain the fishes' electrolyte balance. Current growers use a variety of proprietary tricks to keep fish healthy, reducing their expenses for salt and wastewater discharge permits. Some veterinary authorities speculate that ultraviolet ozone disinfectant systems (widely used for ornamental fish) may play a prominent part in keeping the tilapia healthy with recirculated water. A number of large, well-capitalized ventures in this area have failed. Managing both the biology and markets is complicated. One future development is the combination of integrated recycling systems with urban farming as tried in Sweden by the Greenfish Initiative. This is also called a "flow through system"  Trout and other sport fish are often raised from eggs to fry or fingerlings and then trucked to streams and released. Normally, the fry are raised in long, shallow, concrete tanks, fed with fresh stream water. The fry receive commercial fish food in pellets. While not as efficient as the New Alchemists' method, it is also far simpler and has been used for many years to stock streams with sport fish. European eel (Anguilla anguilla) aquaculturalists procure a limited supply of glass eels, juvenile stages of the European eel which swim north from the Sargasso Sea breeding grounds, for their farms. The European eel is threatened with extinction because of the excessive catch of glass eels by Spanish fishermen and overfishing of adult eels in, e.g., the Dutch IJsselmeer, Netherlands. Although European eel larvae can survive for several weeks, the full life cycle has not yet been achieved in captivity. The issue of feeds in fish farming has been a controversial one. Many cultured fishes (tilapia, carp, catfish, many others) require no meat or fish products in their diets. Top-level carnivores (most salmon species) depend on fish feed of which a portion is usually derived from wild-caught fish (anchovies, menhaden, etc.). Vegetable-derived proteins have successfully replaced fish meal in feeds for carnivorous fishes, but vegetable-derived oils have not successfully been incorporated into the diets of carnivores. Research is underway to try to change this, such that even salmon and other carnivores could be successfully fed with vegetable products. The F3 Challenge (Fish-Free Feed Challenge), as explained by a report from Wired in February 2017, "is a race to sell 100,000 metric tons of fish food, without the fish. Earlier this month, start-ups from places like Pakistan, China, and Belgium joined their American competition at the Google headquarters in Mountain View, California, showing off feed made from seaweed extracts, yeast, and algae grown in bioreactors." However, it will be some years before these efforts have industry-wide effect, if they succeed. Secondly, farmed fish are kept in concentrations never seen in the wild (e.g. 50,000 fish in a 2-acre (8,100 m2) area.). However, fish tend also to be animals that aggregate into large schools at high density. Most successful aquaculture species are schooling species, which do not have social problems at high density. Aquaculturists feel that operating a rearing system above its design capacity or above the social density limit of the fish will result in decreased growth rate and increased feed conversion ratio (kg dry feed/kg of fish produced), which results in increased cost and risk of health problems along with a decrease in profits. Stressing the animals is not desirable, but the concept of and measurement of stress must be viewed from the perspective of the animal using the scientific method. Sea lice, particularly Lepeophtheirus salmonis and various Caligus species, including C. clemensi and C. rogercresseyi, can cause deadly infestations of both farm-grown and wild salmon. Sea lice are ectoparasites which feed on mucus, blood, and skin, and migrate and latch onto the skin of wild salmon during free-swimming, planktonic nauplii and copepodid larval stages, which can persist for several days. Large numbers of highly populated, open-net salmon farms can create exceptionally large concentrations of sea lice; when exposed in river estuaries containing large numbers of open-net farms, many young wild salmon are infected, and do not survive as a result. Adult salmon may survive otherwise critical numbers of sea lice, but small, thin-skinned juvenile salmon migrating to sea are highly vulnerable. On the Pacific coast of Canada, the louse-induced mortality of pink salmon in some regions is commonly over 80%. A 2008 meta-analysis of available data shows that salmon farming reduces the survival of associated wild salmon populations. This relationship has been shown to hold for Atlantic, steelhead, pink, chum, and coho salmon. The decrease in survival or abundance often exceeds 50%. Diseases and parasites are the most commonly cited reasons for such decreases. Some species of sea lice have been noted to target farmed coho and Atlantic salmon. Such parasites have been shown to have an effect on nearby wild fish. One place that has garnered international media attention is British Columbia's Broughton Archipelago. There, juvenile wild salmon must "run a gauntlet" of large fish farms located off-shore near river outlets before making their way to sea. The farms allegedly cause such severe sea lice infestations that one study predicted in 2007 a 99% collapse in the wild salmon population by 2011. This claim, however, has been criticized by numerous scientists who question the correlation between increased fish farming and increases in sea lice infestation among wild salmon. Because of parasite problems, some aquaculture operators frequently use strong antibiotic drugs to keep the fish alive, but many fish still die prematurely at rates up to 30%. In some cases, these drugs have entered the environment. Additionally, the residual presence of these drugs in human food products has become controversial. Use of antibiotics in food production is thought to increase the prevalence of antibiotic resistance in human diseases. At some facilities, the use of antibiotic drugs in aquaculture has decreased considerably due to vaccinations and other techniques. However, most fish-farming operations still use antibiotics, many of which escape into the surrounding environment. The lice and pathogen problems of the 1990s facilitated the development of current treatment methods for sea lice and pathogens, which reduced the stress from parasite/pathogen problems. However, being in an ocean environment, the transfer of disease organisms from the wild fish to the aquaculture fish is an ever-present risk. The large number of fish kept long-term in a single location contributes to habitat destruction of the nearby areas. The high concentrations of fish produce a significant amount of condensed faeces, often contaminated with drugs, which again affects local waterways. However, if the farm is correctly placed in an area with a strong current, the 'pollutants' are flushed out of the area fairly quickly. Not only does this help with the pollution problem, but water with a stronger current also aids in overall fish growth. Concern remains that resultant bacterial growth strips the water of oxygen, reducing or killing off the local marine life. Once an area has been so contaminated, the fish farms are moved to new, uncontaminated areas. This practice has angered nearby fishermen. Other potential problems faced by aquaculturists are the obtaining of various permits and water-use rights, profitability, concerns about invasive species and genetic engineering depending on what species are involved, and interaction with the United Nations Convention on the Law of the Sea. In regards to genetically modified, farmed salmon, concern has been raised over their proven reproductive advantage and how it could potentially decimate local fish populations, if released into the wild. Biologist Rick Howard  did a controlled laboratory study where wild fish and GMO fish were allowed to breed. The GMO fish crowded out the wild fish in spawning beds, but the offspring were less likely to survive. The colorant used to make pen-raised salmon appear rosy like the wild fish has been linked with retinal problems in humans. In 2005, Alaska passed legislation requiring that any genetically altered fish sold in the state be labeled. In 2006, a Consumer Reports investigation revealed that farm-raised salmon is frequently sold as wild. In 2008, the US National Organic Standards Board allowed farmed fish to be labeled as organic provided less than 25% of their feed came from wild fish. This decision was criticized by the advocacy group Food & Water Watch as "bending the rules" about organic labeling. In the European Union, fish labeling as to species, method of production and origin, has been required since 2002. An alternative to outdoor open ocean cage aquaculture, is through the use of a recirculating aquaculture system (RAS). A RAS is a series of culture tanks and filters where water is continuously recycled and monitored to keep optimal conditions year round. To prevent the deterioration of water quality, the water is treated mechanically through the removal of particulate matter and biologically through the conversion of harmful accumulated chemicals into nontoxic ones. Other treatments such as ultraviolet sterilization, ozonation, and oxygen injection are also used to maintain optimal water quality. Through this system, many of the environmental drawbacks of aquaculture are minimized including escaped fish, water usage, and the introduction of pollutants. The practices also increased feed-use efficiency growth by providing optimum water quality. One of the drawbacks to recirculating aquaculture systems is the need for periodic water exchanges. However, the rate of water exchange can be reduced through aquaponics, such as the incorporation of hydroponically grown plants and denitrification. Both methods reduce the amount of nitrate in the water, and can potentially eliminate the need for water exchanges, closing the aquaculture system from the environment. The amount of interaction between the aquaculture system and the environment can be measured through the cumulative feed burden (CFB kg/M3), which measures the amount of feed that goes into the RAS relative to the amount of water and waste discharged. From 2011, a team from the University of Waterloo led by Tahbit Chowdhury and Gordon Graff examined vertical RAS aquaculture designs aimed at producing protein-rich fish species. However, because of its high capital and operating costs, RAS has generally been restricted to practices such as broodstock maturation, larval rearing, fingerling production, research animal production, specific pathogen-free animal production, and caviar and ornamental fish production. As such, research and design work by Chowdhury and Graff remains difficult to implement. Although the use of RAS for other species is considered by many aquaculturalists to be currently impractical, some limited successful implementation of RAS has occurred with high-value product such as barramundi, sturgeon, and live tilapia in the US, eels and catfish in the Netherlands, trout in Denmark and salmon is planned in Scotland and Canada. Tanks saturated with carbon dioxide have been used to make fish unconscious. Their gills are then cut with a knife so that the fish bleed out before they are further processed. This is no longer considered a humane method of slaughter. Methods that induce much less physiological stress are electrical or percussive stunning and this has led to the phasing out of the carbon dioxide slaughter method in Europe. According to T. Håstein of the National Veterinary Institute, "Different methods for slaughter of fish are in place and it is no doubt that many of them may be considered as appalling from an animal welfare point of view." A 2004 report by the EFSA Scientific Panel on Animal Health and Welfare explained: "Many existing commercial killing methods expose fish to substantial suffering over a prolonged period of time. For some species, existing methods, whilst capable of killing fish humanely, are not doing so because operators don’t have the knowledge to evaluate them." Following are some of the less humane ways of killing fish. Air asphyxiation amounts to suffocation in the open air. The process can take upwards of 15 minutes to induce death, although unconsciousness typically sets in sooner. Ice baths or chilling of farmed fish on ice or submerged in near-freezing water is used to dampen muscle movements by the fish and to delay the onset of post-death decay. However, it does not necessarily reduce sensibility to pain; indeed, the chilling process has been shown to elevate cortisol. In addition, reduced body temperature extends the time before fish lose consciousness. Exsanguination without stunning is a process in which fish are taken up from water, held still, and cut so as to cause bleeding. According to references in Yue, this can leave fish writhing for an average of four minutes, and some catfish still responded to noxious stimuli after more than 15 minutes. Immersion in salt followed by gutting or other processing such as smoking is applied to eel. Proper stunning renders the fish unconscious immediately and for a sufficient period of time such that the fish is killed in the slaughter process (e.g. through exsanguination) without regaining consciousness. Percussive stunning involves rendering the fish unconscious with a blow on the head. Electric stunning can be humane when a proper current is made to flow through the fish brain for a sufficient period of time. Electric stunning can be applied after the fish has been taken out of the water (dry stunning) or while the fish is still in the water. The latter generally requires a much higher current and may lead to operator safety issues. An advantage could be that in-water stunning allows fish to be rendered unconscious without stressful handling or displacement. However, improper stunning may not induce insensibility long enough to prevent the fish from enduring exsanguination while conscious. Whether the optimal stunning parameters that researchers have determined in studies are used by the industry in practice is unknown. Fish farming traditionally takes place in purpose-built tanks in the Skardu region in northern Pakistan. ^ Aquaculture, Office of. "Basic Questions about Aquaculture :: Office of Aquaculture". www.nmfs.noaa.gov. Retrieved 2016-06-09. ^ Torrissen, Ole; et al. (2011). "Atlantic Salmon (Salmo Salar): The 'Super-Chicken' Of The Sea?". Reviews in Fisheries Science. 19 (3): 257–278. doi:10.1080/10641262.2011.597890. ^ Weaver, D E (2006). "Design and operations of fine media fluidized bed biofilters for meeting oligotrophic water requirements". Aquacultural Engineering. 34 (3): 303–310. doi:10.1016/j.aquaeng.2005.07.004. ^ Avnimelech, Y; Kochva, M; et al. (1994). "Development of controlled intensive aquaculture systems with a limited water exchange and adjusted carbon to nitrogen ratio". Israeli Journal of Aquaculture Bamidgeh. 46 (3): 119–131. ^ Coxworth, Ben (June 6, 2016). "Scientists take the fish out of fish food". www.gizmag.com. Retrieved 2016-06-08. ^ Sarker, Pallab K.; Kapuscinski, Anne R.; Lanois, Alison J.; Livesey, Erin D.; Bernhard, Katie P.; Coley, Mariah L. (2016-06-03). "Towards Sustainable Aquafeeds: Complete Substitution of Fish Oil with Marine Microalga Schizochytrium sp. Improves Growth and Fatty Acid Deposition in Juvenile Nile Tilapia ( Oreochromis niloticus )". PLOS One. 11 (6): e0156684. Bibcode:2016PLoSO..1156684S. doi:10.1371/journal.pone.0156684. ISSN 1932-6203. PMC 4892564. PMID 27258552. ^ a b c Azevedo-Santos, Valter Monteiro de; Rigolin-Sá, Odila; Pelicice, Fernando Mayer (2011). "Growing, losing or introducing? Cage aquaculture as a vector for the introduction of non-native fish in Furnas Reservoir, Minas Gerais, Brazil". Neotropical Ichthyology. 9 (4): 915–919. doi:10.1590/S1679-62252011000400024. ^ "Offshore fish farming legislation". Archived from the original on 4 February 2016. Retrieved 30 January 2016. ^ The $300 Million Plan to Farm Salmon in the Middle of the Ocean, Bloomberg, 30 July 2018, accessed 31 July 2018. ^ "Lecture Notes on Composite Fish Culture and its Extension in India". Retrieved 30 January 2016. ^ "Ornamental Fish Breeding". Fisheries Department Haryana, Chandigarh, India. Archived from the original on 2017-03-09. ^ Berggren, Alexandra (2007) Aquaculture in Sweden towards a sustainable future?" Master's Thesis, Stockholm University. ^ "Aquaculture". Archived from the original on January 6, 2012. Retrieved 30 January 2016. ^ F3 Fish-Free Feed Challenge, 2017, retrieved 2017-02-07. ^ Molteni, Megan (2017-02-05), "Inside the race to invent a fish-free fish food", Wired, retrieved 2017-02-07. ^ "Fuss over Farming Fish, Alaska Science Forum". Archived from the original on 2012-04-19. Retrieved 30 January 2016. ^ Huntingford, F. A; Adams, C; Braithwaite, V. A; Kadri, S; Pottinger, T. G; Sandoe, P; Turnbull, J. F (2006). "Current issues in fish welfare" (PDF). Journal of Fish Biology. 68 (2): 332–372. doi:10.1111/j.0022-1112.2006.001046.x. ^ Sea Lice and Salmon: Elevating the dialogue on the farmed-wild salmon story Watershed Watch Salmon Society, 2004. ^ Bravo, S (2003). "Sea lice in Chilean salmon farms". Bull. Eur. Assoc. Fish Pathol. 23: 197–200. ^ Morton, A.; Routledge, R.; Peet, C.; Ladwig, A. (2004). "Sea lice (Lepeophtheirus salmonis) infection rates on juvenile pink (Oncorhynchus gorbuscha) and chum (Oncorhynchus keta) salmon in the nearshore marine environment of British Columbia, Canada". Canadian Journal of Fisheries and Aquatic Sciences. 61 (2): 147–157. doi:10.1139/f04-016. ^ Peet, C. R. 2007. Thesis, University of Victoria. ^ Krkošek, M.; Gottesfeld, A.; Proctor, B.; Rolston, D.; Carr-Harris, C.; Lewis, M.A. (2007). "Effects of host migration, diversity, and aquaculture on disease threats to wild fish populations". Proceedings of the Royal Society of London, Series B. 274 (1629): 3141–3149. doi:10.1098/rspb.2007.1122. PMC 2293942. PMID 17939989. ^ Morton, A.; Routledge, R.; Krkošek, M. (2008). "Sea louse infestation in wild juvenile salmon and Pacific herring associated with fish farms off the east-central coast of Vancouver Island, British Columbia". North American Journal of Fisheries Management. 28 (2): 523–532. doi:10.1577/m07-042.1. ^ Krkošek, M.; Lewis, M.A. ; Morton, A.; Frazer, L.N. ; Volpe, J.P. (2006). "Epizootics of wild fish induced by farm fish". Proceedings of the National Academy of Sciences. 103 (42): 15506–15510. Bibcode:2006PNAS..10315506K. doi:10.1073/pnas.0603525103. PMC 1591297. PMID 17021017. ^ Krkošek, Martin; et al. (2007). "Report: "Declining Wild Salmon Populations in Relation to Parasites from Farm Salmon". Science. 318 (5857): 1772–1775. Bibcode:2007Sci...318.1772K. doi:10.1126/science.1148744. PMID 18079401. ^ Ford, JS; Myers, RA (2008). "A Global Assessment of Salmon Aquaculture Impacts on Wild Salmonids". PLOS Biol. 6 (2): e33. doi:10.1371/journal.pbio.0060033. PMC 2235905. PMID 18271629. ^ "Sea Lice Information Bullets". Archived from the original on 2010-05-21. ^ "Fish Farms Drive Wild Salmon Populations Toward Extinction". ScienceDaily. 16 December 2007. Retrieved 2018-01-06. ^ "Northwest Fishletter". Retrieved 30 January 2016. ^ Atlantic Marine Aquaculture Center (2007). "Fish care". University of New Hampshire. Archived from the original on 2009-08-10. ^ Barrionuevo, Alexei (July 26, 2009). "Chile's Antibiotics Use on Salmon Farms Dwarfs That of a Top Rival's". The New York Times. Retrieved 2009-08-28. ^ "Trends in therapy and prophylaxis 1991–2001" (PDF). Bulletin of the European Association of Fish Pathologists. 22 (2): 117–125. 2002. ^ Naylor, RL; Goldburg, RJ; Mooney, H; et al. (1998). "Nature's Subsidies to Shrimp and Salmon Farming". Science. 282 (5390): 883–884. Bibcode:1998Sci...282..883N. doi:10.1126/science.282.5390.883. ^ a b The New York Times. "Salmon Virus Indicts Chile's Fishing Methods". Nyt. Retrieved 27 March 2008. ^ "Purdue scientists: Genetically modified fish could damage ecology". Retrieved 30 January 2016. ^ "Relating to labeling and identification of genetically modified fish and fish products". Alaskan Senate Bill No. 25 of 19 May 2005. Retrieved 2 December 2017. ^ "Consumer Reports reveals that farm-raised salmon is often sold as "wild"". July 5, 2006. Retrieved 29 June 2010. ^ Eilperin, Juliet; Black, Jane (November 20, 2008). "USDA Panel Approves First Rules For Labeling Farmed Fish 'Organic'". The Washington Post. Retrieved 29 June 2010. ^ a b "Environmental Labelling". Archived from the original on March 25, 2010. Retrieved 29 June 2010. ^ "MSC eco-label helps consumers identify certified wild Alaska salmon". January 15, 2004. Retrieved 29 June 2010. ^ (Timmons et al., 2002; Piedrahita, 2003). ^ Whyte, Murray (2008-07-27). "Is high rise farming in Toronto's future?". Toronto Star. Retrieved 2008-08-12. ^ "Sky Farm Proposed for Downtown Toronto". TreeHugger. Retrieved 2009-03-14. ^ Martins, C. I. M.; Eding, E. H.; Verdegem, M. C. J.; Heinsbroek, L. T. N.; Schneider, O.; Blancheton, J. P.; d'Orbcastel, E. R.; Verreth, J. A. J. (2010). "New developments in recirculating aquaculture systems in Europe: A perspective on environmental sustainability" (PDF). Aquacultural Engineering. 43 (3): 83–93. doi:10.1016/j.aquaeng.2010.09.002. Retrieved 22 January 2013. ^ Håstein 2004, pp. 224. ^ a b European Food Safety Authority 2004, pp. 22. ^ "Slaughter of farmed fish – fishcount.org.uk". Retrieved 30 January 2016. ^ a b Yue, pp. 7. Benson, Tess. "Advancing Aquaculture: Fish Welfare at Slaughter" (PDF). Archived from the original (PDF) on 2011-07-21. Retrieved 2011-06-12. Yue, Stephanie. "An HSUS Report: The Welfare of Farmed Fish at Slaughter" (PDF). Humane Society of the United States. Retrieved 2011-06-12. European Food Safety Authority (2004). "Opinion of the Scientific Panel on Animal Health and Welfare on a request from the Commission related to welfare aspects of the main systems of stunning and killing the main commercial species of animals". The EFSA Journal. 2 (7): 45. doi:10.2903/j.efsa.2004.45. D. R. (1993). Aquaculture Training Manual (2nd ed.). John Wiley & Sons. ISBN 978-0-85238-194-6. Manci, Bill. "Fish Farming News--Aquaculture production reaches new heights". Archived from the original on 2014-07-01. Retrieved 2013-11-07. Look up fish farm in Wiktionary, the free dictionary. Wikimedia Commons has media related to Fish farming. This page was last edited on 13 April 2019, at 15:40 (UTC).